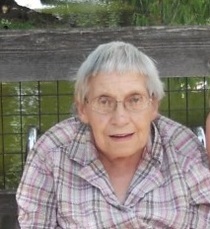 Sadie Johanna Vander Wal was born January 18, 1930 in Marion, ND to George & Johanna (Lengkeek) Van Dyke. She was baptized and confirmed at North Marion Reformed Church in rural North Dakota. She attended Plato country school and completed the 8th grade. She lived with her parents and worked on the family farm until moving to Hospers, Iowa in 1955 where she worked as a telephone operator. There she met and married Dale Vander Wal, who had come to the United States from the Netherlands in 1950. They were married on September 20, 1957 at North Marion Reformed Church. They farmed by Boyden, IA for three years, then by Lake Wilson for six years, then moved to the current family farm near Hadley, MN. Sadie loved the farm, whether she was working with the cows, gardening, watching the birds or feeding the cats. Dale was diagnosed with MS in the mid-1970s. Sadie took care of her husband and continued to run the farm with the help of her children. Dale passed away on July 23, 1989. Sadie loved spending time with her children and grandchildren, which some affectionately called her “Grandma Cows”. Sadie continued to work on the farm with her sons until her health made it necessary to move to Slayton Rehabilitation and Healthcare Center in 2011. She was treated with much love and care during her stay there. Sadie passed away peacefully on February 12, 2018 at 88 years old. Her family meant the world to her, and she will be missed by them. Survivors include her four children: Jolene (Kim) Nelson, Hadley, MN; Allen (Tamara) Vander Wal, Hadley, MN; Greg (Madeline) Vander Wal, Slayton, MN; Rita (Mark) Roland, Sioux Falls, SD; Fifteen Grandchildren, Jesse (Carolina) Nelson, Krista (Dana) Hedberg, Jason (Emily) Nelson, Megan (Corey) Haase, Jayson Schiebout, Davis Vander Wal, Caitlin Vander Wal, Michael Vander Wal, Dana Vander Wal, Stephanie Vander Wal, Miranda (Seth Grohs) Rogers, Dalton (Sammi Ryman) Rogers, Gracie Roland, Sadie Roland, & Marcus Roland; and Eleven Great grandchildren, Alanna, Gage, Bode, Ollie, Theo, Finn, Vincent, Kadince, Ayden, Jaxen, and Wesley. Sadie is also survived by brother, Harry Van Dyke, Ellisville, MO; Sister, Nellie DeBruin, Sheldon, IA; Sisters-in-law, Joyce Van Dyke, Valley City, ND and Gloria Van Dyke, Valley City, ND. She was preceded in death by her husband, parents, brothers Frank, Arie, Peter, and Henry Van Dyke; Brother-in-law Harvey De Bruin, and sisters-in-law Marge and Rena Van Dyke. Services will be held on Monday, Feb. 19, 2018 at the Chandler Reformed Church, Chandler, MN at 11:00 am with Rev. Roger Punt officiating. Julie Reitsma is the organist, and pallbearers are her grandsons, Jesse Nelson, Jason Schiebout, Jason Nelson, Dalton Rogers, Davis Vander Wal, Michael Vander Wal and Marcus Roland. Visitation will be held on Sunday evening, Feb. 18 from 4:00 – 6:00 PM at the Chandler Funeral Home, Chandler, MN. Burial will be held at the Chandler Memorial Cemetery.